The Pabst Brewing Company, an early innovator in national beer marketing and production, was one of Milwaukee’s industrial brewing giants, operating in Milwaukee from 1844 to 1996, and the largest brewer in the United States for a much of the late nineteenth century. 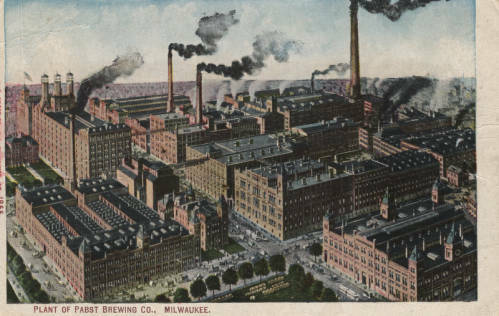 The company originated as the pioneer brewery of Jacob Best, Sr. and his family, established on a ridge west of the Milwaukee River on 9th and Chestnut (now Juneau Ave.) in 1844. As experienced brewers from Mettenheim, Rheinhessen, the Bests steadily expanded and industrialized their operations. The Best family’s leadership of the brewery proved somewhat unstable in these early years. Jacob Best, Sr. retired in 1853, leaving the brewery to his sons, Jacob, Jr. and Phillip. Their brothers Charles and Lorenz had already split off in 1850 to start the Plank Road Brewery (the forerunner to Miller) on the western outskirts of town. Jacob, Jr. and Phillip dissolved their partnership in 1859 after some financial difficulty from the panic of 1857, leaving Phillip in control. In the mid-1860s, Phillip Best brought on his sons-in-law, Frederick Pabst and Emil Schandein, as partners in the brewery. Although Pabst, a lake steamer captain, and Schandein, a scientist, were not experienced brewers, their different insights in marketing, transportation, engineering, and science quickly improved the brewery’s prospects. Phillip Best retired in 1866, selling his shares to Pabst and Schandein, who retained the Phillip Best and Company name. The company changed its name to the Pabst Brewing Company shortly after Schandein’s death in 1888, but retained the “B” in its logo to symbolize the brewery’s historic and continued connection to the Best family. The company’s innovative approaches to national beer marketing kept it on top of the national industry through much of the late nineteenth century. Pabst was a major sponsor of the 1889 National Encampment of the Grand Army of the Republic in Milwaukee, helping to promote the company’s name and reputation with visiting Civil War veterans. The company won gold medals at the 1876 Centennial Exposition in Philadelphia, the 1878 World’s Fair in Paris, and the 1893 World’s Columbian Exposition in Chicago. Best/Pabst touted these awards and brand in national advertising campaigns that included ads in newspapers, magazines, railroad timetables, and theater programs, promotional calendars and booklets, and souvenir cigar cases, matchboxes, and notepads. In 1882, the company began tying small blue ribbons around its “Best’s Select” bottled beer, changing the label’s name to Pabst Blue Ribbon after its victory at the 1893 Chicago Columbian Exposition. The company also promoted its name and bolstered sales through major real estate developments. Like its other local rivals (especially Schlitz), Best/Pabst invested heavily in building and maintaining “tied house” saloons in Milwaukee, Chicago, and many other American cities between the 1880s and early 1900s. More importantly, however, the company made major investments in developing “famous places” in Milwaukee that would add prestige to the Best/Pabst brand. These included the Schuetzen Park beer garden on North Third Street (now Martin Luther King, Jr. Drive) and Burleigh, which the company purchased in 1872 and renamed Pabst Park in 1890; the Pabst Whitefish Bay Resort, built on the shores of Lake Michigan north of the city in 1888; the Pabst Theater, which they purchased in 1890 and refurbished after a major fire in 1895; the Pabst Hotel, purchased and remodeled in 1890; and the Pabst Gargoyle Restaurant, built downtown in 1906. Pabst survived Prohibition, producing near beer, malt syrup, and sodas, among other items. Pabst also manufactured processed cheese from milk produced at the Pabst Holstein Farms in Oconomowoc, including “Pabst-ett” brand cheddar. The Pabst Realty Company split off from the Pabst Corporation to manage or sell the company’s vast real estate holdings. Pabst quickly returned to its position among the top national brewing leaders after the repeal of prohibition in 1933 but remained behind its two chief rivals, Schlitz and Anheuser-Busch, for much of the remainder of the twentieth century. The company’s continued success was due in part to its early adoption of new brewing innovations, such as the sale of canned beer beginning in 1935 and the national expansion of its beer production in the 1930s and 1940s. Pabst continued its expansion, purchasing the Hoffman Beverage Company of Newark, New Jersey in 1945, and the Los Angeles Brewing Company in 1948, turning them into satellite plants for their Pabst Blue Ribbon brand. Pabst innovated in radio and television marketing in the 1940s and 1950s. Pabst sponsored a short-lived Saturday evening CBS radio program from 1943-1944, “Blue Ribbon Town,” featuring Groucho Marx, which broadcast from Milwaukee as part of Pabst’s centennial celebration. Pabst sponsored radio and television broadcasts of boxing matches from Madison Square Garden, titled “Blue Ribbon Bouts,” from 1948 to 1955. Pabst furthermore featured their popular “What’ll You Have?” slogan in radio and television jingles and print advertisements in the 1950s. Pabst slipped out of the top five national brewers by 1956 but improved its standing by purchasing the Blatz Brewing Company in 1958 and bringing former Blatz CEO, James C. Windham on as president. This move returned Pabst to the third largest national brewer by 1961. A federal anti-trust suit forced the company to sell Blatz in 1969. The company remained among the top national leaders through a new period of expansions in the 1970s and early 1980s. Pabst built a new brewery in Perry, Georgia in 1971, purchased the Blitz-Weinhard Brewing Company of Portland, Oregon in 1979, and the Olympia Brewing Company in Olympia Washington in 1982. Pabst sold to venture capitalist Paul Kalmanovitz’s S&P Company in 1985 and closed its Milwaukee plant and moved its corporate headquarters to suburban Chicago in 1996. Pabst survives as a holding company and “virtual brewer,” contracting out its large portfolio of familiar national brands to large brewers, like Miller. It retains the potential to reestablish a brewing presence in Milwaukee. The Joseph Zilber Group began redeveloping the Pabst brewery into a complex of new and renovated buildings named “The Brewery” for offices, loft apartments, education facilities for UW-Milwaukee and Cardinal Stritch University, senior living, retail, and parking in the late-2000s and early 2010s. ^ Thomas C. Cochran, The Pabst Brewing Company: The History of an American Business (New York: New York University Press, 1948), 3-10, 23-29. ^ Ibid., 31; Jerry Apps, Breweries of Wisconsin (Madison: University of Wisconsin Press, 1992), 123. ^ Cochran, Pabst, 46-50, 102-103. ^ In 1869, the company purchased their larger local rival, the Melms brewery, located on the southern bank of the Menomonee River. Schandein managed this new South Side Brewery, and Pabst headed the original plant, renamed the Empire Brewery. This move helped launch Best and Company into leadership of the local industry by 1870 and the national industry by 1874. It also started a significant form of growth for the company in the acquisition of rivals, which they continued with their purchase of the Falk, Jung, and Borchert Brewing Company in 1892, and other national rivals in the early-to-mid-twentieth century. The brewery incorporated as the Phillip Best Brewing Company in 1873 with Pabst as president and Schandein as vice-president. Ibid., 49-50, 56-57; 59-60; 66-67; 82-83; 87-88; Apps, Breweries of Wisconsin, 125; Stanley Baron, Brewed in America: A History of Beer and Ale in the United States (Boston: Little, Brown, 1962), 268. ^ Baron, Brewed in America, 258. ^ Cochran, Pabst, 143-146, 226-227. ^ Harry H. Anderson, “Recreation, Entertainment, and Open Space: Park Traditions in Milwaukee County,” in Trading Post to Metropolis: Milwaukee County’s First 150 Years, ed. Ralph M. Aderman (Milwaukee: Milwaukee County Historical Society, 1987), 260-262; Cochran, Pabst, 213, 223, 256-258; Apps, Breweries of Wisconsin, 128. ^ Apps, Breweries of Wisconsin, 103-104. ^ Pabst merged with the Peoria-based Premier Malt Products Company in 1932, forming the Premier-Pabst Corporation with Premier’s Harris Perlstein as president, and Frederick Pabst, Jr. as a vice-president. The corporation changed its name back to the Pabst Brewing Company in 1938 with Frederick Pabst, Jr. serving as chairman of the board until 1954, and Perlstein serving as company president until 1956 and chairman until 1972. Kenan Heise, “Obituaries: Harris Perlstein, 93, Ex-Pabst Chairman,” Chicago Tribune, August 19, 1986; Cochran, Pabst, 372-373. ^ Baron, Brewed in America, 340-341. ^ John Dunning, On the Air: The Encyclopedia of Old-Time Radio (Oxford: Oxford University Press, 1998), 99. ^ “Pabst Blue Ribbon Bouts,” Old Time Radio Catalogue, accessed July 15, 2014; “Advertisement: Another Blue Ribbon Event, Joe Louis vs. Ezzard Charles,” LIFE Magazine, September 25, 1950. ^ Victor J. Tremblay and Carol Horton Tremblay, The U.S. Brewing Industry: Data and Economic Analysis (Cambridge, MA: MIT Press, 2005), 68–69, 82. ^ Mittelman, Brewing Battles, 153-154; Apps, Breweries of Wisconsin, 101; Tremblay and Tremblay, U.S. Brewing Industry, 68, 82. ^ Tremblay and Tremblay, U.S. Brewing Industry, 82. ^ Apps, Breweries of Wisconsin, 131; Tremblay and Tremblay, U.S. Brewing Industry, 83. ^ Georgia Pabst, “Pabst Shutdown Decision ‘Deplorable,’ Kleczka Says,” Milwaukee Journal Sentinel, October 18, 1996; Alan J. Borsuk, “Taps for Pabst: City’s Oldest Brewery Closing After 152 Years,” Milwaukee Journal Sentinel, October 18, 1996; Tremblay and Tremblay, U.S. Brewing Industry, 84. ^ Mittelman, Brewing Battles, 167; Tom Daykin, “Pabst Closing Its Last Brewery,” JSOnline, July 24, 2001, http://www.jsonline.com/bym/news/jul01/pabst24072301a.asp, last accessed May 31, 2014; “Pabst Brewing Company Beers,” accessed May 31, 2014. ^ Tom Daykin, “Pabst Will Brew Beer Again in Milwaukee at Site of Historic Brewery,” JSOnline, July 15, 2015. ^ “About The Brewery,” The Brewery: A Joseph J. Zilber Historic Redevelopment, accessed July 15, 2014, http://www.thebrewerymke.com/about/index.htm. The information is now available at http://www.thebrewerymke.com/about.html.